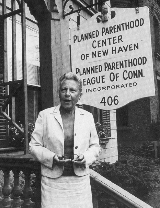 Appellant Griswold is Executive Director of the Planned Parenthood League of Connecticut. Appellant Buxton is a licensed physician and a professor at the Yale Medical School who served as Medical Director for the League at its Center in New Haven - a center open and operating from November 1 to November 10, 1961, when appellants were arrested. They gave information, instruction, and medical advice to married persons as to the means of preventing conception. They examined the wife and prescribed the best contraceptive device or material for her use. Fees were usually charged, although some couples were serviced free. Coming to the merits, we are met with a wide range of questions that implicate the Due Process Clause of the Fourteenth Amendment. Overtones of some arguments suggest that Lochner v. New York, 198 U.S. 45, should be our guide. But we decline that invitation. We do not sit as a super-legislature to determine the wisdom, need, and propriety of laws that touch economic problems, business affairs, or social conditions. This law, however, operates directly on an intimate relation of husband and wife and their physician's role in one aspect of that relation. The association of people is not mentioned in the Constitution nor in the Bill of Rights. The right to educate a child in a school of the parents' choice - whether public or private or parochial - is also not mentioned. Nor is the right to study any particular subject or any foreign language. Yet the First Amendment has been construed to include certain of those rights. By Pierce v. Society of Sisters, supra, the right to educate one's children as one chooses is made applicable to the States by the force of the First and Fourteenth Amendments. By Meyer v. Nebraska, supra, the same dignity is given the right to study the German language in a private school. In other words, the State may not, consistently with the spirit of the First Amendment, contract the spectrum of available knowledge... And so we reaffirm the principle of the Pierce and the Meyer cases. In NAACP v. Alabama we protected the "freedom to associate and privacy in one's associations," noting that freedom of association was a peripheral First Amendment right. Disclosure of membership lists of a constitutionally valid association, we held, was invalid "as entailing the likelihood of a substantial restraint upon the exercise by petitioner's members of their right to freedom of association." Ibid. In other words, the First Amendment has a penumbra where privacy is protected from governmental intrusion. The right of "association," like the right of belief (Board of Education v. Barnette, 319 U.S. 624), is more than the right to attend a meeting; it includes the right to express one's attitudes or philosophies by membership in a group or by affiliation with it or by other lawful means. Association in that context is a form of expression of opinion; and while it is not expressly included in the First Amendment its existence is necessary in making the express guarantees fully meaningful. The foregoing cases suggest that specific guarantees in the Bill of Rights have penumbras, formed by emanations from those guarantees that help give them life and substance. Various guarantees create zones of privacy. The right of association contained in the penumbra of the First Amendment is one, as we have seen. The Third Amendment in its prohibition against the quartering of soldiers "in any house" in time of peace without the consent of the owner is another facet of that privacy. The Fourth Amendment explicitly affirms the "right of the people to be secure in their persons, houses, papers, and effects, against unreasonable searches and seizures." The Fifth Amendment in its Self-Incrimination Clause enables the citizen to create a zone of privacy which government may not force him to surrender tohis detriment. The Ninth Amendment provides: "The enumeration in the Constitution, of certain rights, shall not be construed to deny or disparage others retained by the people." The Fourth and Fifth Amendments were described... as protection against all governmental invasions "of the sanctity of a man's home and the privacies of life." We have had many controversies over these penumbral rights of "privacy and repose." These cases bear witness that the right of privacy which presses for recognition here is a legitimate one. The present case, then, concerns a relationship lying within the zone of privacy created by several fundamental constitutional guarantees. And it concerns a law which, in forbidding the use of contraceptives rather than regulating their manufacture or sale, seeks to achieve its goals by means having a maximum destructive impact upon that relationship. Such a law cannot stand in light of the familiar principle, so often applied by this Court, that a "governmental purpose to control or prevent activities constitutionally subject to state regulation may not be achieved by means which sweep unnecessarily broadly and thereby invade the area of protected freedoms." . Would we allow the police to search the sacred precincts of marital bedrooms for telltale signs of the use of contraceptives? The very idea is repulsive to the notions of privacy surrounding the marriage relationship. We deal with a right of privacy older than the Bill of Rights - older than our political parties, older than our school system. Marriage is a coming together for better or for worse, hopefully enduring, and intimate to the degree of being sacred. It is an association that promotes a way of life, not causes; a harmony in living, not political faiths; a bilateral loyalty, not commercial or social projects. Yet it is an association for as noble a purpose as any involved in our prior decisions. I agree with the Court that Connecticut's birth-control law unconstitutionally intrudes upon the right of marital privacy, and I join in its opinion and judgment. Although I have not accepted the view that "due process" as used in the Fourteenth Amendment incorporates all of the first eight Amendments, I do agree that the concept of liberty protects those personal rights that are fundamental, and is not confined to the specific terms of the Bill of Rights. My conclusion that the concept of liberty is not so restricted and that it embraces the right of marital privacy though that right is not mentioned explicitly in the Constitution is supported both by numerous decisions of this Court, referred to in the Court's opinion, and by the language and history of the Ninth Amendment. In reaching the conclusion that the right of marital privacy is protected, as being within the protected penumbra of specific guarantees of the Bill of Rights, the Court refers to the Ninth Amendment, I add these words to emphasize the relevance of that Amendment to the Court's holding. The Court stated many years ago that the Due Process Clause protects those liberties that are "so rooted in the traditions and conscience of our people as to be ranked as fundamental." To hold that a right so basic and fundamental and so deep-rooted in our society as the right of privacy in marriage may be infringed because that right is not guaranteed in so many words by the first eight amendments to the Constitution is to ignore the Ninth Amendment and to give it no effect whatsoever. Moreover, a judicial construction that this fundamental right is not protected by the Constitution because it is not mentioned in explicit terms by one of the first eight amendments or elsewhere in the Constitution would violate the Ninth Amendment, which specifically states that "[t]he enumeration in the Constitution, of certain rights, shall not be construed to deny or disparage others retained by the people...."
In determining which rights are fundamental, judges are not left at large to decide cases in light of their personal and private notions. Rather, they must look to the "traditions and [collective] conscience of our people" to determine whether a principle is "so rooted [there] . . . as to be ranked as fundamental." The inquiry is whether a right involved "is of such a character that it cannot be denied without violating those `fundamental principles of liberty and justice which lie at the base of all our civil and political institutions' . . . ."
recognizes, there are fundamental personal rights such as this one, which are protected from abridgment by the Government though not specifically mentioned in the Constitution. The logic of the dissents would sanction federal or state legislation that seems to me even more plainly unconstitutional than the statute before us. Surely the Government, absent a showing of a compelling subordinating state interest, could not decree that all husbands and wives must be sterilized after two children have been born to them. Yet by their reasoningsuch an invasion of marital privacy would not be subject to constitutional challenge because, while it might be "silly," noprovision of the Constitution specifically prevents the Government from curtailing the marital right to bear children and raise a family. While it may shock some of my Brethren that the Court today holds that the Constitution protects the right of marital privacy, in my view it is far more shocking to believe that the personal liberty guaranteed by the Constitution does not include protection against such totalitarian limitation of family size, which is at complete variance with our constitutional concepts. Yet, if upon a showing of a slender basis of rationality, a law outlawing voluntary birth control by married persons is valid, then, by the same reasoning, a law requiring compulsory birth control also would seem to be valid. In my view, however, both types of law would unjustifiably intrude upon rights of marital privacy which are constitutionally protected. I agree with my Brother STEWART'S dissenting opinion. And like him I do not to any extent whatever base my view that this Connecticut law is constitutional on a belief that the law is wise or that its policy is a good one. In order that there may be no room at all to doubt why I vote as I do, I feel constrained to add that the law is every bit as offensive to me as it is to my Brethren of the majority and my Brothers HARLAN, WHITE and GOLDBERG who, reciting reasons why it is offensive to them, hold it unconstitutional. There is no single one of the graphic and eloquent strictures and criticisms fired at the policy of this Connecticut law either by the Court's opinion or by those of my concurring Brethren to which I cannot subscribe - except their conclusion that the evil qualities they see in the law make it unconstitutional. The Court talks about a constitutional "right of privacy" as though there is some constitutional provision or provisions forbidding any law ever to be passed which might abridge the "privacy" of individuals. But there is not. There are, of course, guarantees in certain specific constitutional provisions which are designed in part to protect privacy at certain times and places with respect to certain activities. Such, for example, is the Fourth Amendment's guarantee against "unreasonable searches and seizures." But I think it belittles that Amendment to talk about it as though it protects nothing but "privacy." To treat it that way is to give it a niggardly interpretation, not the kind of liberal reading I think any Bill of Rights provision should be given. The average man would very likely not have his feelings soothed any more by having his property seized openly than by having it seized privately and by stealth. He simply wants his property left alone. And a person can be just as much, if not more, irritated, annoyed and injured by an unceremonious public arrest by a policeman as he is by a seizure in the privacy of his office or home. One of the most effective ways of diluting or expanding a constitutionally guaranteed right is to substitute for the crucial word or words of a constitutional guarantee another word or words, more or less flexible and more or less restricted in meaning. This fact is well illustrated by the use of the term "right of privacy" as a comprehensive substitute for the Fourth Amendment's guarantee against "unreasonable searches and seizures." "Privacy" is a broad, abstract and ambiguous concept which can easily be shrunken in meaning but which can also, on the other hand, easily be interpreted as a constitutional ban against many things other than searches and seizures. I like my privacy as well as the next one, but I am nevertheless compelled to admit that government has a right to invade it unless prohibited by some specific constitutional provision. For these reasons I cannot agree with the Court's judgment and the reasons it gives for holding thisConnecticut law unconstitutional. the same thing, are to prevail, they require judges to determine what is or is not constitutional on the basis of their own appraisal of what laws are unwise or unnecessary. The power to make such decisions is of course that of a legislative body. Surely it has to be admitted that no provision of the Constitution specifically gives such blanket power to courts to exercise such a supervisory veto over the wisdom and value of legislative policies and to hold unconstitutional those laws which they believe unwise or dangerous. I realize that many good and able men have eloquently spoken and written, sometimes in rhapsodical strains, about the duty of this Court to keep the Constitution in tune with the times. The idea is that the Constitution must be changed from time to time and that this Court is charged with a duty to make those changes. For myself, I must with all deference reject that philosophy. The Constitution makers knew the need for change and provided for it. Amendments suggested by the people's elected representatives can be submitted to the people or their selected agents for ratification. That method of change was good for our Fathers, and being somewhat old-fashioned I must add it is good enough for me. And so, I cannot rely on the Due Process Clause or the Ninth Amendment or any mysterious and uncertain natural law concept as a reason for striking down this state law. The Due Process Clause with an "arbitrary and capricious" or "shocking to the conscience" formula was liberally used by this Court to strike down economic legislation in the early decades of this century, threatening, many people thought, the tranquility and stability of the Nation. See, e. g., Lochner v. New York, 198 U.S. 45. That formula, based on subjective considerations of "natural justice," is no less dangerous when used to enforce this Court's views about personal rights than those about economic rights. I had thought that we had laid that formula, as a means for striking down state legislation, to rest once and for all.